The history of Apple stretches back four decades. Sandwiched between the early successes of the 1970s to early 1980s and later dominance of the company in the twenty-first century, there was a long period during which Apple lost direction and at various points it seemed the company had no future. One product from these years of doldrums was the MessagePad line, often simply known as the "Apple Newton" after the unique operating system. A tablet-sized device originally launched in 1993, the original MessagePad was an interesting idea, but it was too far ahead of the available technology to really be a success. 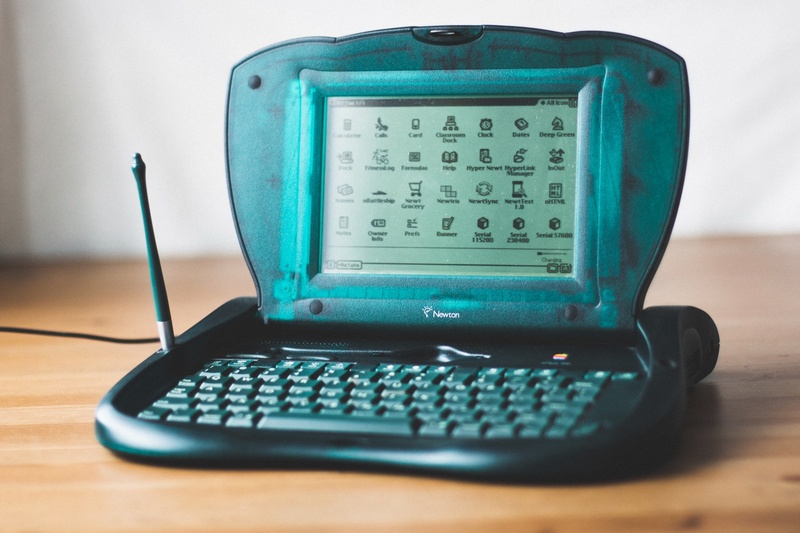 In March 1997 the most unusual addition to this range was launched - the eMate 300. 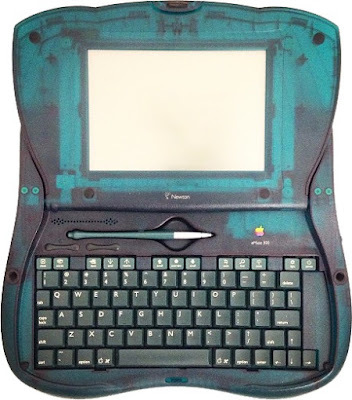 Where previous MessagePads used a stylus and handwriting recognition, the eMate 300 was a different beast with a physical QWERTY keyboard housed in a colourful, oversized clamshell case. The eMate 300 was designed for use in schools, and the simple-to-use operating system and relatively inexpensive price tag (compared to other Apple products) along with the tough and rather funky green case reflected this. In many ways, the eMate 300 was a reflection of the original Mac when it came to being an all-in-one computing appliance. The screen was a 6.8" 480 x 320 greyscale panel, a bit smaller than the display in an iPad mini but in a much bigger case. Users could store data on special flash memory cards, and there were various expansion capabilities including a PCMCIA slot. The CPU was a 25 MHz ARM 710 unit, perhaps foreshadowing the huge popularity of ARM processors in mobile devices today. Although the eMate 300 was available for sale through educational channels only, some found their way into other applications. It was an interesting device, but it never reached its full potential and in February 1998 the recently-returned Steve Jobs killed the entire MessagePad / Newton product line. The legacy of the MessagePad line is fairly obvious - the iPad and iPhone. The translucent case idea found critical acclaim with the original iMac, which helped to reverse Apple's declining fortunes. These days the eMate 300 is pretty much forgotten, due in part that it only really sold in educational circles and even those seemed to be in the United States only. These days there are quite a few eMate 300s available, with prices topping out at $150 or so for a good one.